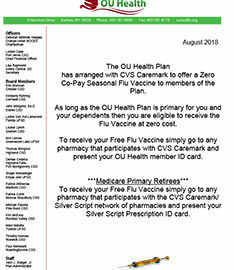 The OU Health Plan has arranged with CVS Caremark to offer a Zero Co-Pay Seasonal Flu Vaccine to members of the Plan. 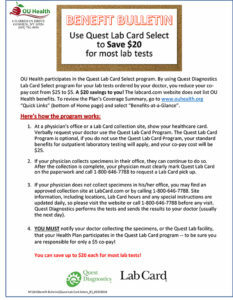 As long as the OU Health Plan is primary for you and your dependents then you are eligible to receive the Flu Vaccine at zero cost. To receive your Free Flu Vaccine simply go to any pharmacy that participates with CVS Caremark and present your OU Health member ID card.